Gothic Creepy Crypt-Keeper FAUX STONE GARGOYLE with LIGHTS and SOUND will guard over your haunted house or Halloween horror celebration in frightful style! 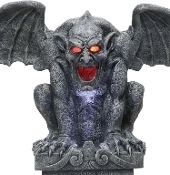 Highly detailed fully dimensional gargoyle statue sits atop a plat-formed tombstone with RIP molded in the center. When activated, the gargoyle features a spooky bright LED light that glows through the scary hollow eyes and mouth and onto the chest, as unearthly sounds of a tolling requiem bell and rolling thunder play in the background. The HAUNTED RIP GARGOYLE statue is the perfect gothic addition to help transform your home into the spookiest cemetery, mysterious castle or creepy crypt! An optional fog *hose (*included) allows you to produce fog that comes out the mouth for an even creepier effect when used with YOUR OWN *fog machine (*Fog Machine NOT included). Choose from Steady-On or Motion and Sound Sensor activation options to operate.